AFP Interactive Hyper Fetch Super Bounce Tennis Balls have been specially developed for the AFP Interactive Hyper Fetch and the AFP Interactive Hyper Fetch Mini. All For Paws specialise in designing unique and stylish products for dogs and cats. The team behind All For Paws continually strives to design products that meet both the needs of the animals, but also fit the different lifestyles of their owners. All For Paws describe them as functional products with a story and a purpose. All For Paws products are available worldwide and, of course also, from Vetsend.co.uk. AFP Interactive Hyper Fetch Super Bounce Tennis Balls are made for the AFP Interactive Hyper Fetch and the AFP Interactive Hyper Fetch Mini. The balls come in packs of six. The diameter of a ball is 5 cm. 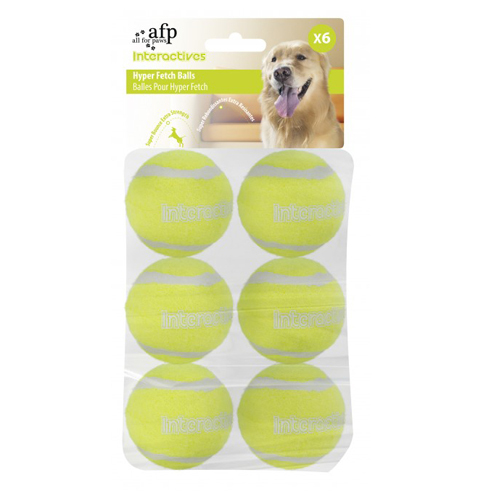 Have you used AFP Interactive Hyper Fetch Super Bounce Tennis Balls before? Let us know what you think about this product.